Although a connection to Autism from Vaccines has been dismissed repeatedly in the current media(no surprise), scientific studies that are based on biological processes show a significant link. CDC epidemiological studies also show a strong link of Thimerosal to ADD, Learning Disabilities, Speech Delay and Autism. gain enormous profits, from the policy that is made. 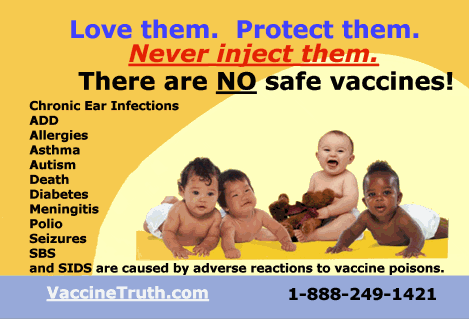 The FDA recently acknowledged that 90 percent of doctors do not report vaccine reactions. They are choosing to subvert this law by claiming the adverse event was, in their opinion, not related to the shot. In fact, every year between 12,000 and 14,000 reports of adverse reactions to vaccines are made to the FDA (data initially accessible only through the Freedom of Information Act). These figures include hospitalizations, irreversible brain damage, and hundreds of deaths. Considering that these numbers may represent just 10 percent, the true figures could be as high as 140,000 adverse events annually. However, even this figure could be conservative. According to Dr. David Kessler, former head of the Food and Drug Administration, “Only about 1 percent of serious events [adverse drug reactions] are reported to the FDA.” Thus, it is entirely possible that millions of people are adversely affected by mandatory vaccines every year. The Recent Gold and Silver Selloff: Anatomy of a Crime! Has the Government Looted the Gold at Fort Knox? Bush has a sneering contempt for the law. The Next Big Autism Bomb: Are 1 in 50 Kids Potentially At Risk? Bilderberg 2007 – Towards a One World Empire?